WOW!! Even the other villa owners say this about our home, If you are looking for the best go no further. This is strictly for you sun-seekers, as apart from visiting the Mouse; the sun after all is another great reason to visit Florida. This home has a elegantly shaped 36' x 20' heated 'Hollywood' Style designer-pool,with its on fibre optic light show, changing the colour of the water every 30 seconds on a huge 60’x 54’ south-facing deck, so you can soak up the sun all day, or relax in our enormous 10-person hot-tub, with your friends and family, while watching the magnificent sunset over Star Lake, cool drink in hand, after your gruelling day at Disney. If the heat gets you, relax in the air-conditioned splendour of the villa, and the family room with its gigantic,55" ceiling hung 4K HD T.V. screen with the Home Theatre surround sound, better than a cinema, whilst chilling-out under our unique amazing Chinese cooling fans. If you have the energy how about a game of Air Hockey, Pool, or darts, or the PS-2 games console in the Bada Bing games room, and if the kids are beating you, send them upstairs, while you feign an injury and get yourself a Rolling-Ball Back-rub on one of our two Robotic Massage Chairs,or open your Laptop, and use our Wi-Fi enabled Internet, or why not try your luck, Fishing in our Lake with our Fishing Rods. When it’s time for bed the cosseting continues, with our sumptuous King pillow-top mattresses in the three masters and the Queen, believe me you just won’t want to get out of these things, and why should you, especially with TV/DVD/VCR 27'/LCD 37' combos in the masters, and 20' TV/DVD combos in all other bedrooms, with over 200 hundred Cable channels, including Fox Sports and the Golf Channel and HBO, we even have a High Powered sound system to pipe music to every room on the ground floor including the lanai and pool deck, part of villa living is the absence of people knocking on your door hassling you to make up the room, so you can stay there as long as you like, after all this is your home for now. And it has everything you would expect it to have and more; fully equipped kitchen, laundry-room, towels, do not bring anything but your clothes. Any problems, there is a management company on call 24/7 to help you. This magnificent home is situated between the Moon and Star lakes on Formosa Gardens, in its own ¼ acre lot, assuring you of the privacy that you deserve. If you don't know, Formosa Gardens is renowned throughout the world as the premier gated-community with its close proximity to Disney and shops. This house has been designed in an stunning Oriental theme, and no expense has been spared on this seven-bedroom six-bathroom home. The photo is of Joye and I on Vacation in Sorrento Italy, we went to attend her neices wedding, Joye was made redundant from her job, at the Bank of America, where she had worked for 21 years, as a Compliance Officer, in the UK Branch. I, had spent 20 Years in the Sign Trade, and after I had had two Heart Attacks, an By-Pass and some and other Medical Conditions, we both decided now was the time to Retire. we both loved to travel, so that was an ideal time to get out and see the world. When you drive into Formosa Gardens, you will answer that question yourself, it is just so different from anything around, the Disney area, and the homes are so big and in there own grounds. 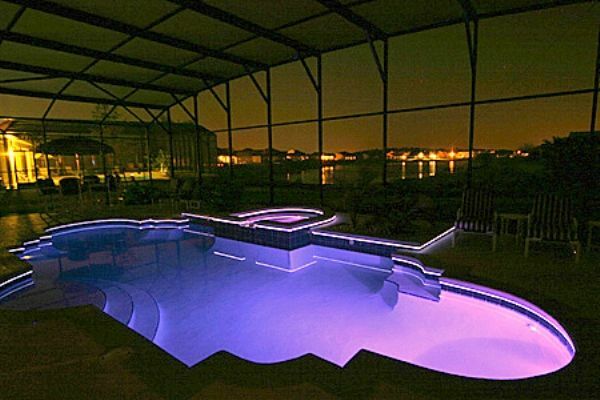 Award Winning Villa - Voted the Best Kissimmee Vacation Rental 2011-2012 See Our Virtual http://17571888.n48835.test.prositehosting.co.uk/virtualtours/Godfrey/bb/ We have just about everything in the place, the Fans, The Massage Chairs, the Lake, and that Hollywood Pool. CORPORATE PARTIES...Why stay in a dingy hotel and pay through the nose for it, more and more companies are now booking rental homes,during there convention or sales meetings, and getting a beautiful home, with you own private pool, at a fraction of the cost of a hotel room...Email or call me, for the prices and dates. South facing pool overlooking the lake, fishing is allowed, and 10lb Bass has been pulled from this Lake. Surround Sound Home Entertainment Centre, High Powered Amp, inbuilt speakers in every room and pool area. Accessible Ramp to the Front, and some Removable ones inside, also the Blue Master has a Double Door for easy Entrance, and the Shower has a Hand Held Device with a Rain Shower head, wth a Removable Sit Down Seat, plus Grab Handles in their, and by the toilet. 'Sopranos' Bada Bing Themed Games Room, 2 Robotic Massage Chairs, Fishing Rods supplied to Fish the Lake, 55 Ceiling Hung 4K Smart TV, awesome Home Theater, Better than a cinema, Wi-FI enabled throughout the home, High powered Amp, Stereo Sound Speakers in every room, 200 channel Satellite TV, TV/DVD combos in every room, Fox sports Golf channel HBO, Computer, High Powered Stereo, CD/DVD Player, Washer & 2 Dryers, 10 Person Private Hot Tub, Fibre Optic Lighting, Wheelchair Friendly, Ramps to front of House, and Movable ones inside, Blue Bedroom also set up for or Senior Citizens. From start to finish this has been a dream. It is always difficult finding a villa to suit everyones needs. Will it be as the pictures show? Is everything legit? We all have the same concerns. We were a family of 12 + a six month old baby and we stayed here for three weeks in July/August 1018. There was lots of space for everyone to have their privacy yet lots of communal space too. All the fixtures and fittings were top notch. The laundry room was great and it was also great to have air con in the games room for the air hockey and pool leagues! Outside was beautiful, lots of space to sit. A lovely BBQ and a pool that was used everyday. It was great to do the parks in the morning and come back to 'chill out' in the afternoon. There is a brand new Walmart only a 5 minute drive away which was really convenient. Alan, the owner has been brilliant at every point. Answering all my questions promptly. He has owned the property for 15 years and clearly loves it. His management agency in Orlando were great too. Very prompt in solving any little problems we had. I cannot recommend this villa highly enough and we wished we had booked 4 weeks! I would go back tomorrow if I could. Book it - You'll love it! Hi Claire. Thank You for your Review, you know that you where the Best Guest ever, and you must come back and see us again, 4 Weeks this TIme, and I will always look after my Returning Familys. We stayed at the property for a work trip. Really enjoyed our stay especially the pool and hot tub! For the second straight year, a group of 7-8 golfers stayed at the house, and we greatly enjoyed it each year. What is particularly excellent is that there are 7 bedrooms, so almost everyone got their own room, and 5 of the rooms had their own bathroom. The lanai with pool and hot tub is another highlght of the place...it’s a great place to relax after a tough day of golfing and beer drinking! The house is in a nice, gated neighborhood and is centrally located to many of the places we wanted to go. I imagine this would be a great place for an extended family to stay as well as it is minutes from Disney. Thank you for your Review, many Golfers return Year after Year, as the Home and Central Florida is still the Perfect Place for both.......Alan. We had a group of guys for our annual golf trip; having the whole group in one house was great. Our family had an awesome time! We had 5 families, 22 total persons! We loved the time we spent together at the pool and at mealtimes! My husband and I take our kids and their kids on a vacation every year; this is the first year we rented a house where we could all stay together. We also visited Universal. It was awesome! The grandkids and kids will talk about this year’s vacation for years! We spent two weeks at 'The Water's Edge in August and had a wonderful holiday with our family of 12. The property is more like home from home than a holiday home. The decor is lovely and well stocked with crockery etc. Beds are very comfortable and furnishings are lovely. The children loved the pool and spent many happy hours in it. Theme parks are fairly close so very convenient. It was everything we had hoped for and more and I would highly recommend. Thanks Chris and Derek, for your Review, let me just say you where the Best Guests Ever, you make sure you come back at anytime, and tell your Friends about us........Alan. CORPORATE PARTIES...Why stay in an expensive hotel and pay through the nose for it, more and more companies are now booking rental homes, during there convention or sales meetings, and getting a beautiful home, with your own private pool, at a fraction of the cost of a hotel room...Email or call for the prices and dates. Fishing Nearby, There Is A Golf Course Within 30 Mins Drive, Golf Course Is On Site Or Within 15 Mins Walk, Water Park Nearby, Water sports Nearby, Nearest Beach: 80.0 km. The Rate Counter is not always Accurate, Please call or email (Better) I will respond within the Hour, and can give you a Better Deal and Discount, and its not always a 7 Day Minimum, email me with your Requirements, and we can probably work something out.